Pokémon GO players looking to get their hands on a Shiny Meltan will not have to wait any longer. 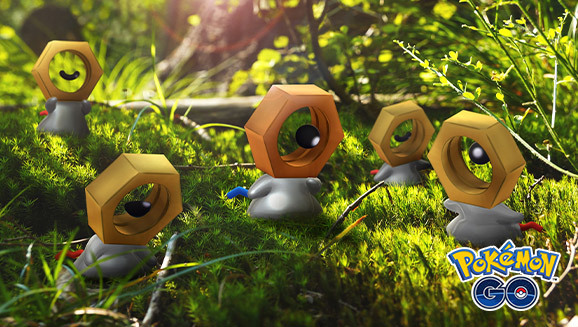 The Pokémon Company has announced that Shiny Meltan will appear in Mystery Boxes in Pokémon GO for a limited time. The Mythical Pokémon has a darker face then the normal Meltan and has blue tail instead of red. Since the launch of Pokémon: Let’s Go, Pikachu! and Pokémon: Let’s Go, Eevee!on November 16, 2018, Trainers have been busy transferring Pokémon fromPokémon GO into these games! To show our appreciation, a Shiny version of the Mythical Pokémon Meltan will appear in Pokémon GO for a limited time. A Shiny version of this Pokémon has never been seen…until now. The Shiny version has a slightly darker face than normal, as well as a blue tail instead of the usual red. Meltan is a rare Pokémon that appears only when a Mystery Box is used in Pokémon GO. In turn, a Mystery Box can be obtained only by linking Pokémon GO with Pokémon: Let’s Go, Pikachu! or Pokémon: Let’s Go, Eevee! Use your Mystery Box anytime Tuesday, February 5, 2019, through Monday, March 4, 2019, for the chance to catch Shiny Meltan. And it seems as if the time players have to wait between Mystery Box uses might get reduced, too! Once you catch Shiny Meltan in Pokémon GO, you can bring it over to Pokémon: Let’s Go, Pikachu! and Pokémon: Let’s Go, Eevee! Don’t miss out on this chance to catch a Shiny Meltan and take it with you on your adventures on the Nintendo Switch system. Crack open a Mystery Box in Pokémon GO anytime Tuesday, February 5, 2019, through Monday, March 4, 2019, and keep your eye out for Shiny Meltan!